Protest group SCRAM (Staff College Residents Against Madness) have claimed victory after Secretary of State agrees with the inspector's recommendation that the appeal by Taylor Wimpey be dismissed. The inspector was called in after the council who gave approval for the initial 750 homes rejected an additional proposal of 390 homes which could have included 6 storey flats (the original agreement was for 3 storey flats). This rejection resulted in an appeal by builder George Wimpey which lend to an enquiry headed by government inspector Edward Simpson. The additional request would have greatly reduced the parks open park space as advertised in there own leaflets. 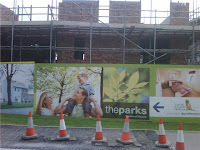 (The Parks had used very green imagery for their adverts which would have been very misleading if this had gone ahead). It also removed the sports field. It is pleasing to see that people power and clever and detailed campaigning by local residents can produce a sensible result. It is extremely important that when building projects are planned they provide affordable (that’s real affordable housing) and green space especially in light of Britain’s disappearing school fields and general playing areas. It should be noted that the first phase of the development is nearing completion as 104 of 220 are now complete and occupied on 28th July 09. Ray Earwicker Lib Dem PPC for Bracknell constituency had examined the Parks proposals with his concerns for affordable housing last year here . Living in a flat is a costly business. If you brought one like I have and believed it was cheaper than a house, think again. Firstly service charges can be more than the council tax (mine is). The flats I live in are mixed with leaseholders and housing association tenants. Therefore leaseholds can't really take control of the service costs and manage them for themselves under the Commonhold and Leasehold Reform 2002. Not all of the leaseholders can commit the time to such a thing anyway. I also suspect that when things go smoothly no one will recognise it but if something did go wrong at some point then you could be in trouble with your fellow leaseholders. Then there is the question of how well does your housing association or agent performs when repairs are needed? What is happening to the sink fund? Are the lease holders paying the right percentage of service charges? When major works are conducted say to the parking area, windows or lifts then you are expected to pay a big bill of several thousand pounds. The windows cost over £3,500 per person at my flats although the bigger you’re flat the more you will have to pay. Most people who live in flats are there because they can't afford a house. Therefore us flat owners are generally not the richest of people and this kind of expense is just a massive worry. The cost is only an estimate (our estimate varied by at least a grand), the final bill is an unknown until the actual day the final bill arrives; now that’s a scary day! As you don't really have any control over who is selected and what work is done. You naturally can’t believe how high the bill is or understand why. It can also be very hard to negotiate on the value only on how you pay, how you structure your payments is of course up to the generosity of your housing association or agent. At a later date one of my neighbours will make a guest blog on the service charges and the costs of works based on their personal experience. Please let me know if you have had experience of high service charges or works at your flats. I have been following the political fallout from Scottish justice secretary Kenny MacAskill MSP decision to grant an early release to terminally-ill Abdelbaset Ali al-Megrahi both here and in the USA. I wanted to examine three particular points of the whole episode. I cant help but feel that the attacks by the MSP's on the Kenny MacAskill SNP decision are from a purely political stand point and are simply political point scoring. When asked on a BBC Radio Five Live report if they would of come to the same decision during yesterdays Scottish parliament meeting, in general the opposition MSP interviewed seem to side step the issue and some believed they would of came to the same decision. I actually believe that under the usual Scottish rules Kenny MacAskill had to let him go using the information he was provided with (i.e. 3 months to live and past parole record recommendations). But he should not of visited Megrahi in prison as this does look bad on Kenny MacAskill and he did not visit any of the American families also a bad decision. For my own personal feelings on the matter are that I would find it very hard to make a decision I mean Megrahi was given up by the Libyan government but did they make a deal with the other bombers? He was convicted and Scottish law should apply but I still cannot decide one way or the other if he should of been released, I personally think the wishes of the families are more important than that of a convicted bomber. I understand the American families reaction as they fully believe in the courts verdict where as most of the British relatives want further investigation and some believe that Megrahi was not the main bomb plotter. But I guess now we will never know. As for boycotting Scottish or British goods I would say to those Americans who plan too. You have every right to be greatly displeased with Kenny MacAskill decision to release Megrahi but do not forget that Scottish and British people are fighting with Americans recently in Iraq and currently in Afghanistan providing the 2nd biggest foreign force and are very much engaged in operations dying and being injured for this cause. Surely for this alone the British and Scottish people deserve your support and not a boycott of goods and services. In some ways the reception received by Megrahi is a cultural one. One which we in the west do not understand. This was not as much as a heroes reception as it looked. Libya is still a very tribal country and most people at the airport reception were members of this tribe or extended family, this was a tribal welcome not a wholly countries Libyan welcome. There was no street parade arranged and at the moment the media are not being granted access to Megrahi. With respect to Gordon Brown PM taking so much time to make a statement on the matter. Which he has now come out and stated that he was "angry and repulsed" at the jubilant reception Megrahi received. Brown always appears to not act in good time to these situations although sometimes politically it can be best to say nothing (not that its the right thing to do). But to never say anything for such along time and then add your comments so late in the day, now that really does not look good Mr Brown. These delays just leave Gordon Brown open to attack and political criticism surely has learnt this by now. For some reason I always bump into the same conservative activist who always has a lot of questions for us on the EU. It will be interesting to see what the Tories do in relation to the EU when (as I’m sure they will) win the next election. Will they have a referendum on the EU and if so how far will they go? The same guy conceded that he thinks there are too many councillors from the same party in power in Bracknell and he believed this can’t be good for democracy. Although during the 2007 council elections he was extremely happy at the time he declared. I was asked about a tea room for the elderly. I do remember that there used to be one which closed down some time ago. I could really see that being a good idea. At the moment there is a lot of choice if you are after expensive coffee but this does exclude the elderly who loved to meet at the tea room. It would be nice to have a community tea room. One chap who was in the army for many years believed that after he was ill he was paid less than someone he met at hospital who was foreign. I don't know the full facts but I was told that he wrote to Andrew Mackay MP about this and that Andrew wrote back stating that he could not help. I imagine it would be hard to investigate and find out the true facts. Payments may be assessed on a lot of factors which may or may not turn out to be fair depending on personal view points (Do you assess current finances or past record of service to the country?). I also had an interesting conversion about caring for people with alzheimer's. I will blog on this subject at some point. But needless to say I think this is a very terrible and ignored disease. 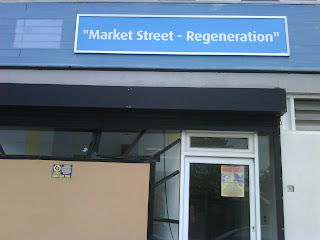 There were many complaints about the lack of a full regeneration for Bracknell Town Centre. There were also many comments on the 3m building in town. The public of Bracknell are willing to engage with politicians despite the recent expenses scandals. There were very few completes about MP's expenses, immigration or rubbish bins which are often subjects raised on the door step. As reported on Bracknell Lib Dems web site Ray Earwicker, Lib Dem PPC goes on a walkabout at 11am in the Bracknell town centre this Saturday(22nd August). I indent to be there myself and I will report back on the comments from the voters we meet in town. Feel free to come along and ask any questions. Isn’t our English language wonderful? We are always coming up with new terms and phrases. One I like is ‘Have a go Hero’. I believe in general we are not involved enough in our local communities and perhaps do not intervene when we should because we are scared and believe that it is none of our business. There are also plenty of examples where people do not intervene when someone is attacked and passers by just look on or pass. However there have also been plenty of reports where having a go has resulted in that person being attacked themselves. I for one am willing to have a go and have done so. Although I have not always been proud of my reactions I do intervene. So far I have not put myself in danger. I have found to my amazement (spurred on by anger and my sense of right and wrong) that I have achieved results. For example I have managed to stop some kids from throwing stones at cars and some adults from not clearing up there seat on a train when they left food all other it (train was packed) etc. But I do not tend to intervene where I live because I don’t want to be hassled at my home (is that wrong of me?). I will speak to my neighbours all of which I know, after the event. (Events include loud arguments, vandalism, Drug and drink issues). I personally think that having a go is up to the individual and there is nothing wrong with being too scared to intervene. However if a crime is happening there and then you should tell the police ASAP because simply walking away from someone doing harm is very wrong (how can you leave someone who is in trouble). Would you have a go or have you had a go and when you did what happened? Please comment? Do you think Britain would be a better for it, if people stood up to yobs? Is Tesco Bullying Bracknell Forest Council? Bracknell Forest Council have withdrawn their objections to the late opening and Sunday opening of the Tesco’s store in Martins Heron. Bracknell Forest Council had already refused permission for the store to open from 7am to 10pm during the week and 10am to 4pm on Sundays and bank holidays. Tory councillor Trevor Kensall has been heading these objections to stop the store from opening longer because of strong public objections. One of these objections was because of the noise made by delivery lorries in the morning and their effect on traffic as well as customer traffic (This site also has a train station which is busy at rush hour). Tesco appealed against the decision which would of cost the council a fair sum in legal fees, it is also believed that the council did not expect to win. It has been widely reported that Tesco know how to get what they want as reported in the Independent here and by Reading’s Gareth Epps Lib Dem councillor here. Is this just another example of bullying or Is the Tesco request for longer opening hours fair? The latest proposal made after public consultation by BAA for the Heathrow rail line extension (Airtrack), which intends to link Reading and Waterloo to Heathrow via Stains. This should result in running an extra two trains an hour on this line bring the total to 4 trains per hour. The example given in the report would cut travel from 1 hour and 25 minutes to 25 minutes from Wokingham to Heathrow. It is intended that all tickets will be valid for these trains allowing users to use all trains. 5. Building a train depot in Feltham. The above proposal has now gone to the Secretary of state for Transport to seek authorisation for these works and to examine any objections and to decide if a public inquiry is required. A new train station in Stains town centre was rejected after public consultation. Will the ticket price remain the same? The 2nd consultation Brochure (here) states that ‘Passengers will be able to use these new services to travel between existing stations, without payment of any supplement’. Will the trains be faster? There will be a train that runs direct from Bracknell to Stains every hour. Once a commuter arrives at Stains the commuter can change and get a direct train to London Waterloo. No train times have yet been produced, so waiting times at Stains are not known. How does this effect Bracknell? If it is possible to add two more trains then why has there not been some faster trains added from Bracknell and Wokingham in the mornings. Currently it takes 1 hour to travel from Bracknell to London Waterloo. Where as if you travelled from Farnborough to Waterloo this only takes 40 (38 to 42) minutes to cover a similar distance (of course there are fewer stops). Bracknell has a train running at 2 and 32 minutes past the hour but in the morning there is an extra train at 7.39 if this extra train was moved to 7.50 surely it could go directly to waterloo and save time without affecting the level crossing any more than the current service does. This train service could stop at Reading, Wokingham, Bracknell & Clapham for example. Only a small change to an existing train service but this change would allow commuters an extra option for an improved service. For Bracknell itself it would naturally be good to have an improved service, but why can this not be improved now as far as a direct train is concerned? It should be noted that while extra trains are needed on this route if a Heathrow service was introduced, there are objections to this raised in Wokingham because of expected additional traffic congestion at level crossings (see http://www.waterloo-road.org/). Perhaps a timetable could be drawn up so that the effects of extra trains can be discussed and examined. All notices and proposals for Airtrack can be read here . There has been a demand for a new health facility in the centre of Bracknell offering an extended range of health services. Plans for a new health centre have now been released and will be known as a ‘health space’. What the public of course always wanted was a hospital but this would prove too costly. This facility will be built in Market Street near Bracknell train station and by built by Ashley House and G4S Integrated Services consortium. The Berkshire East Primary Care Trust (PCT) (part of the consortium investigating future healthcare provision in Bracknell) and developer Ashley House have unvalued there plans for a new health centre in Bracknell (detailed here). The new health centre in Bracknell will include cancer treatment and a fitness centre. It should also be offering GP services and some emergency services as well as out-patient facilities but will not have facilities for overnight stay. The centre should be built in 2011 and will be very close to the Skimped Hill Medical Centre, it will also have space to expand upwards if this was later required. Meanwhile Heatherwood hospital is under continued review with rumours of word closers or ward moves to Wexham park hospital in Slough. I do fear that the new (and Welcomed) health space could pave the way for the closure of Heatherwood Hospital which still offers services that the new healthcare centre cannot offer as it has no overnight stay arrangements. For example the case of Sally Ingram daughter Kerry, aged 10 from Warfield, who has regular treatment for brittle bones at Heatherwood (highlighted here). Russ Bryant campaigner and resident of Bracknell has set up a group on social networking site Facebook called ‘Stop Erosion of Services at Heatherwood’. This can be joined here. I have found that some people talk about Bracknell as a chav town. Naturally I believe this is unfair as Bracknell is really a young families town with low unemployment and hard working people. Now I believe when people (by that I believe I mean middle class people generally) use the word chav they mean it for two very generalised groups. 1 Young guys wearing sports gear (not the expensive kind) who don't work or don't want to work and who they want to avoid as they are perceived to be dangerous. 2 Young ladies who have a number of kids and who don't work as they can use benefits to their advantage etc etc. Now let me clarify that im not having a go at anyone individual or group im just writing about the kind of comments people make down the pub or in general conversations that people just don't write about for fear of being branded a snob or worse. I think it should be ok to approach any subject on a blog although I imagine the red top news papers could easily get away with using words like Chav. My background is growing up in the Great Holland's council estate in Bracknell with a young family (my mum was a young single mum herself after her first marriage before getting remarried). My dad was a working man who used his printing experience to start his own business with a partner and then buy the council house we lived in, sell it and move out of Bracknell to Crowthorne (so we moved from a working class area to a middle class area). What im trying to say is that im not sure if im working class or middle class, I have a middle class job but I live in perhaps a working class area. I also know people from lots of very varied backgrounds including some people who others would brand a chav based on first look (of course their situations are more complicated then that). I also don't think that calling people words like Chav is helpful but unfortunately I know what people mean by this word. What they really mean generally are people who don't want to work, live off benefits, don't care about what others think to the point that they have little interest in the wider world (dont vote) and are excluded from the wealthier parts of our society and perhaps have reduced personal goals. I think that this is not a working class grouping from the point of view that if you have no intention to work then how can you be working class. I truly never really noticed this for myself in Bracknell but others have told me what they think when they pop into town. So I sat in the Bentals cafe with my posh coffee during my lunch break and people watched. I saw 3 young ladies take their 8 kids into the pub at midday, 3 sports cloths wearing young men kicking cans thought town. A couple arguing in the street and a mum grabbing her kid roughly and pushing them while the girl was crying and mum was shouting. Now I have to admit that this is all very stereo typical and it does make me feel sad. I did however see many more people who would not of fallen into the stereotype. 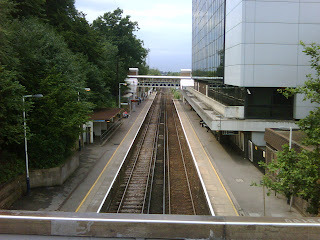 One problem for Bracknell town centre is that it does not attract as varied a cliental as it should and many people just travel to Reading or Camberley instead of Bracknell, including many people who live in Bracknell. The middle classes just don't understand why people want to live on benefits. There is nothing wrong with bring your kids up full time I believe as there can be many good reasons why. However some people I know off have kids so they don't need to work without actually realising how hard it is to bring kids up. This may seem natural if your part of a culture where your friends have done or do the same thing. Often its people not really thinking about what they could achieve not knowing what they want and not given a hand with achieving something better. If you don't have respect for yourself or your future then you won't have respect for others or indeed the country we live in. I do feel that doors have been closed for example you need a degree for everything these days where as before you could just go and learn your trade. We need to help people who don't care about themselves to care again to see that there is more to life than this. Of course this is not an easy task and its not just about education but also about the way we treat each other. People like to stick within their own like minded safe groups, perhaps too much. If we are more polite to each other (even when people are not polite to us) and didn't generalise people into groups (tried to not) then maybe that would be a good start. But of course it is up to people who fall into benefit culture to pick themselves up too and push themselves to achieve better and realise there is a big world out there with many opportunities you just need to sometimes apply your imagination and thought to improving your own situation. I think for the most part the political classes tend to not try hard enough to get their vote and are therefore some people are more removed from our democracy. You could say there is a growing exclusion of some part of society because they are not as targeted as say the elderly or middle classes. So they are even less likely to vote and so the cycle continues. I do think that Bracknell is unfairly seen as a chav town by some as it has plenty of working class and middle class people living within it all trying to make ends meet . If you knocked on every door in Bracknell (I have knocked on a lot of doors in Bracknell too boot) you would find that the vast majority do not fit this Chav Stereotype. If the town centre was improved then this perception would change. If we mixed a little more all of our attitudes may change for the better and our good points would rub of on each other.